We’re moving again! Or rather, a part of the Manchester Muslim Writers is moving to a new monthly venue – and we’re going to be meeting on a different night too! We’re shuffling our adult Muslim Writers group to a Monday night. Our first session at the Edge Theatre and Arts Centre in Chorlton takes place on October the 23rd! 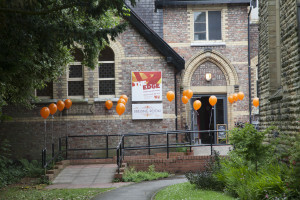 We started life in 2009 in a community centre which is now closed, Shakespeare House, which was situated on the boundary between Fallowfield and Whalley Range. That was great for many years. We occasionally foraged further afield, but we remained quietly loyal to Shakespeare House until 2015 when we realised the centre would be closing and we moved to Chorlton Library. To be more precise, we moved to the rear of Chorlton Library, to the Community Room, which is used for Sure Start children’s sessions. The space is great for most of our sessions, but it isn’t suited for more than thirty people at a time and we needed a space geared for performance. Many of our members are spoken word artists and they’ve been crying out for a venue that supports performance and that’s where the Edge fits snug as a bug. What will happen on 23rd October? Doors will open at 6:30pm and that will be perfect for those who need a coffee or cup of chai before they throw themselves onto the stage. The event will properly begin at 7pm and we’ll be introducing and reintroducing the Muslim Writers and then we’ll be showcasing some of our own talent and inviting writers to have a go themselves. We’re expecting poems and performances from a myriad of regulars to the Muslim Writers including: Aisha Mirza, Hafsah Bashir, Shahid Khan, Zahid Hussain and others. We have a limit of 70 people for the space, but it will be an intimate and memorable evening. Have we totally abandoned Chorlton Library? Heck no! We’re actually going to use the Friday sessions (which have become a feature of MMW) to connect with a much younger audience – we’re launching MMW Juniors, shorter sessions in creative writing for younger children, primary school age and upwards. We’ve done sessions for children in the past, but this is something of a departure for us and perhaps it’s an indication of the growing need to develop writing talent in younger children. Despite MMW existing since 2009, the narrative around Muslims has worsened. We need to address this imbalance and share our own incredible stories and we need to nurture that talent now. We are limited in terms of tickets due to health and safety reasons. The launch will also be open to children, but any child must be accompanied by their parent or guardian.